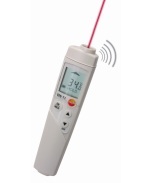 Testo 826-T2 for non-contact and fast temperature checks (with laser sighting) on food; easy and without damaging the packaging. The adjustable acoustic alarm sounds immediately a limit value is exceeded. Two practical accessory parts are supplied: 1.) The TopSafe case protects the instrument from dust, dirt, impact and water. 2.) Wall/belt holder for fast positioning of meter. 112 TruReward$ points will be placed in your account when you buy this item.